As part of the annual campaign #GivingTuesday, Penguin Random House authors are supporting chosen causes as part of a donation match drive led by Facebook and PayPal. 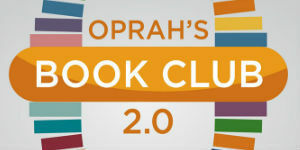 Three authors have been highlighted by Facebook to shine a light on their efforts and maximize giving. Credit goes to their marketing representatives Elina Vaysbeyn (Dutton); Jin Yu (Berkley); and Brianne Sperber and Shauna Barry (Crown) for helping to make these connections. Since launching these donation drives, the authors have already raised tens of thousands of dollars in contributions. For any questions, please reach out to Kate Rados. The students from Parkland, Florida who founded The March For Our Lives after the Marjory Stoneman Douglas High School shooting, are now adding a book to their movement. GLIMMER OF HOPE: How Tragedy Sparked a Movement will be the official, definitive book from the founders and will document the ongoing fight for sensible gun control legislation and their journey on the road to change. 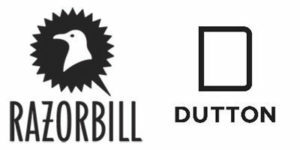 In a rare move, Razorbill, a Penguin Young Readers imprint, and Dutton, an adult imprint of Penguin Publishing Group, have teamed up to sell this single title together and jointly market the book, which will go on sale on October 16. 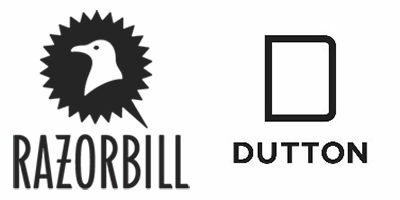 The announcement was made on Monday by Ben Schrank, President and Publisher of Razorbill, and Christine Ball, Senior Vice President, Publisher of Dutton, who acquired North American rights from Creative Artists Agency (CAA). Razorbill Associate Publisher Casey McIntyre and Dutton Vice President, Executive Editor Jill Schwartzman, are co-editing. The full advance, all author royalties, and the agency’s commission will be donated to the March For Our Lives Foundation. 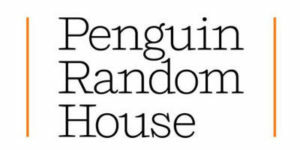 In addition, Penguin Random House will donate a portion of its profits to March for Our Lives Foundation and during the week of on-sale, Penguin Random House will also match all employee donations to March for Our Lives Foundation by its employees. GLIMMER OF HOPE will feature original first-person essays by the founders, including Emma González, Jaclyn Corin, Cameron Kasky, and Matt Deitsch, and include oral histories and other contributions from twenty other founders and members of the group. It will also highlight key policy initiatives that the founders support. Despite still being in high school, the founders of The March for Our Lives have not stopped working since the march. Leading up to the midterms, their work is more important than ever: since the tragedy at Marjory Stoneman Douglas in February, there have been eleven more school shootings across the United States. Currently they are on the Road to Change Tour where they are making over 50 planned stops across America to motivate and register young people to vote. Collectively the founders have said: “GLIMMER OF HOPE will be a permanent, tangible way to document the events we’ve endured and the journey we have lying ahead. March For Our Lives began organically, just a couple dozen teenagers on a living room floor, using trial-and-error processing and self-governing tactics. It’s important that we write this book collectively, because we wouldn’t be where we are today if it weren’t for the differing efforts of each and every one of us.” March For Our Lives was created by, inspired by, and led by the students of Parkland, but has since curated student allies of all ethnicities, religions and sexualities across the country. The mission and focus of March For Our Lives is to assure that no special interest group or political agenda is more critical than the timely passage of legislation to effectively address the gun violence issues that are rampant in our country. We demand morally-just leaders to rise up from both parties in order to ensure public safety. The full list of contributors, in alphabetical order, are: Adam Alhanti, Dylan Baierlein, John Barnitt, Alfonso Calderón, Sarah Chadwick, Jaclyn Corin, Matt Deitsch, Ryan Deitsch, Sam Deitsch, Brendan Duff, Emma González, Chris Grady, David Hogg, Cameron Kasky, Jammal Lemy, Kirsten McConnell, Charlie Mirsky, Diego Pfeiffer, Kyrah Simon, Delaney Tarr, Bradley Thornton, Kevin Trejos, Naomi Wadler, Sofie Whitney, Daniel Williams, and Alex Wind. 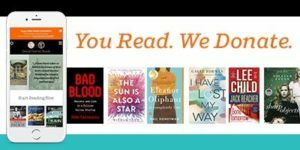 Penguin Random House continues to honor its dedication to literacy at the annual American Library Association Conference and Exhibition, where our 2018 Penguin Random House Library Awards for Innovation grant winners were announced. 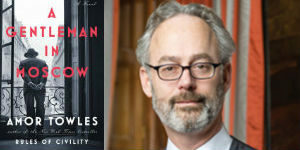 Skip Dye, Vice President & Director of Operations and Library Sales, Penguin Random House, presented the awards at the Penguin Random House Librarian Reception, held on the opening day of last month’s ALA conference at the Ernest N. Morial Convention Center in New Orleans. As part of the first-place award, conference registration, travel, and lodging expense was included. Meridian Library’s Youth Services Librarian Skye Corey accepted the award on behalf of Gretchen Caserotti at the Penguin Random House reception. 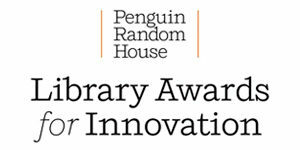 For more about the Penguin Random House Library Awards for Innovation and this year’s recipients, please visit our website at https://foundation.penguinrandomhouse.com. Penguin Random House Ireland partnered with the Fighting Words charity, an organization in Dublin dedicated to helping youth and young adults discover and cultivate their passions for creative writing. The charity recently launched its latest anthology, BEYOND BOUNDARIES, an inspired collection of short stories written by fourth year students at the Manor House School and edited by the PRH Ireland editorial team. 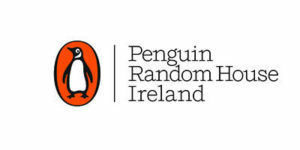 The anthology features a written introduction by Penguin Ireland author, Sinéad Moriarty, in which she writes: In a year where women have stood up, spoken out and no longer been afraid to call out bad behaviour, it’s lovely to see a short story compilation from a group of young, fresh-faced and talented girls. The stories cover a wide range of subject matters and plots that will make you sit up and pay attention. Some will move you to tears, others will make you laugh and some will make you gasp out loud. Fighting Words is a charity working throughout Ireland to help children, young people and adults discover and harness the power of their own imagination and creative writing skills. Fighting Words volunteers provide free tutoring and mentoring in creative writing and related arts. Each year, an anthology of students’ work is published, with the students at the center of the project drafting and editing the stories, choosing the title of the book and working with a designer on the cover. PRH Ireland editors devote their time to editing the stories in the anthology and support the efforts by talking to the students about the process of publishing a book. Penguin Ireland author, Sinéad Moriarty wrote the introduction for this year’s anthology and also helped launch the book with the students. Vintage author, Roddy Doyle, is a member of the board and actively supports and promotes the work of Fighting Words. 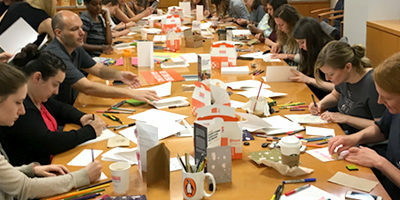 Last Friday, June 1, Penguin Publishing Group recognized National Gun Violence Awareness Day by organizing an event at our 375 Hudson Street offices for Penguin Random House employees to make and write care-cards for families of victims of gun violence. Over the course of two hours, dozens of our colleagues created more than 130 hand-designed and thoughtfully written cards. They’ll be distributed to members of the Everytown Survivor Network, which brings together survivors, victims, and loved ones of those affected by gun violence. Penguin Publishing Group’s partnership with Everytown for Gun Safety continued the next day at BookCon, where PPG and Everytown invited book lovers passing through the Penguin Random House booth to show their support for #WearOrange by writing and posting orange Post-It notes to several dedication walls labeled “I #WearOrange because…”. For every Post-It note shared, Penguin Random House donated $5.00 to Everytown for Gun Safety. Representatives from the Everytown Authors Council, including Penguin author Chris Healy, joined Penguin Random House staff in greeting and talking to visitors, many of whom wanted to share their own stories. 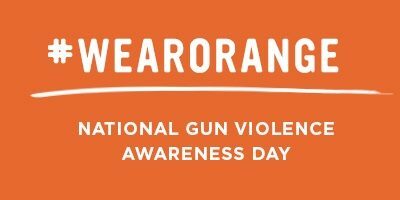 The #WearOrange movement originated on June 2, 2015 in honor of Hadiya Pendleton, a 15-year-old girl who was shot and killed in Chicago one week after marching in President Obama’s 2nd D.C. inaugural parade in January 2013. In the days and weeks following, Hadija’s friends commemorated her by wearing orange – the color many hunters wear in the woods to protect themselves and others from harm. There are several ways to donate to #WearOrange and its partner organizations, who are working hard every day to build a future where every American can live free from gun violence. For a full list, click here. “We've worked with schools since 2009, usually two a year. Our first school had 330 kids who read 56,000 books in order to ride in our truck. More recently, we just do displays; let the kids see the truck; answer questions, and give away pictures, Frisbees, posters, and my favorite Penguin Random House books.” Beth branded the program Rev Up for Reading, because, “for me, this is where the rubber meets the road: My love for books and reading; and supporting reading for our youth. “When we hear the stories about kids who could not read at the beginning of the school year; but can read by the end of the year it inspires us to do more. When we hear that kids read 30,000 minutes – that's one class of 22 - 24 students – just to see our truck, it means we are doing something right.” Look at the expressions on the faces of these children – who read for 30,000 minutes – posing with the Monster Truck. Beth and her husband deserve special commendation for the remarkable results that their program has achieved. 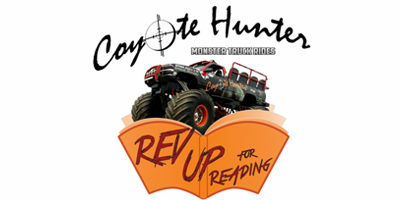 For more information about Rev Up for Reading, click here. Other ways to participate include wearing an orange piece of clothing on June 1 or creating your own #WearOrange image for social sharing. 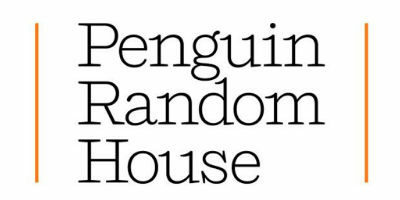 Additionally, Penguin Publishing Group and Everytown will be partnering on an in-booth activation at BookCon, at the Javits convention center, from 2:00 to 3:30 p.m. on June 2. Attendees can participate in a dedication wall as well as a #WearOrange photo op. 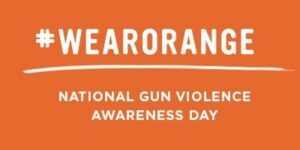 The #WearOrange movement originated on June 2, 2015 in honor of Hadiya Pendleton, a 15-year-old girl who was shot and killed in Chicago one week after marching in President Obama’s 2nd D.C. inaugural parade in January 2013. In the days and weeks following, Hadija’s friends commemorated her by wearing orange – the color many hunters wear in the woods to protect themselves and others from harm. There are several ways to donate to #WearOrange and its partner organizations, who are working hard every day to build a future where every American can live free from gun violence. For a full list, click here. DK recently participated in Roar For Change, a global challenge organized by Lucasfilm and Star Wars: Force for Change in support of UNICEF. The initiative invites fans and families to share their own version of Chewbacca’s iconic roar. 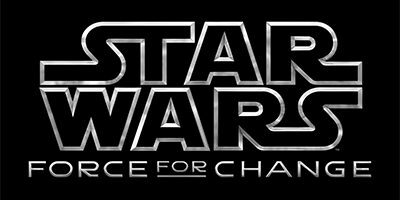 For each public post, like, or share on Facebook, Instagram or Twitter that includes #RoarForChange through May 25, Star Wars: Force for Change U.S. will donate $1 to UNICEF USA, up to $1 million. Funds will be used to support UNICEF’s lifesaving work for children around the world. Fans can share their best Chewbacca impersonation, don Hasbro’s Electronic Chewbacca mask, or create a Dubsmash using one of Chewbacca’s best-known roars from the Star Wars saga, which will be hosted on the app’s homepage for the duration of the campaign. The initiative kicked off with a video featuring the cast of Solo: A Star Wars Story, revealing Chewbacca’s diva behavior on the set of the new movie, which hits theaters on May 25. Check out DK’s video here. DK invites PRH Star Wars enthusiasts to join the #RoarForChange challenge and support this worthy cause. Learn more about the campaign at ForceForChange.com. *Campaign hashtag: #RoarForChange Star Wars: Force for Change, a charitable initiative from Lucasfilm and Disney, harnesses the strength of Star Wars to empower and improve the lives of children around the world. Since 2014 when it was inspired by Star Wars fans, Star Wars: Force for Change has raised over $16 million to date for charitable causes around the world.